Who makes the best brick porches in Detroit, MI? Brickworks Property Restoration, of course! 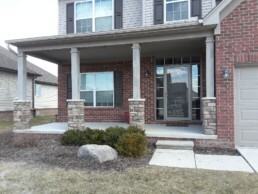 Our masonry contractors in Detroit are fully licensed and insured to build, repair, or replace your brick porch. No matter how old your home might be, we can work on creating an inviting, beautiful porch to add to the front. 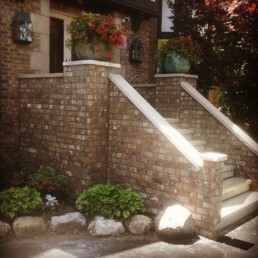 Call us today at (586) 868-3234 to learn more about our quality brickwork. A brick porch can be a beautiful addition to just about any home. Plus, brick porches are more durable and yet cost nearly the same amount as wooden alternatives. Still, even the best brick porches are susceptible to water damage, especially after years or erosion. 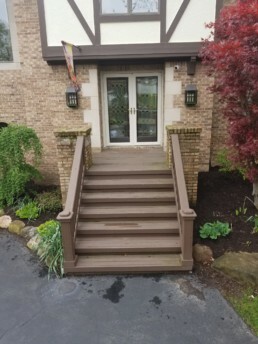 Fortunately, the team at Brickworks can help you cover every aspect of a brick-porch home project, including repair, replacement, and installing custom posts, steps, and railings. What’s more, we offer full-scale foundation repair when the damage extends beneath the surface. We’re also more than comfortable starting a project from scratch. When you partner with us, you can be confident your porch will be built by professionals with longevity in mind. Your porch is the first thing visitors will notice about your house –– so don’t neglect this vital feature of your home. 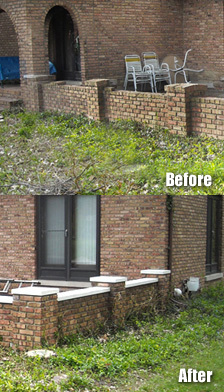 Using boilerplate solutions and mismatched bricks will leave you with an eyesore in your front lawn. Instead, consider reaching out to the Brickworks team today. In addition to providing top-quality porch repair, we also specialize in building porches from the ground up. Lastly, we’ll find bricks that exactly match your home’s appearance in color and texture. To take great care of your porch, be careful which ice melting methods you employ as many ice melters with salt in them can damage your brick porch. 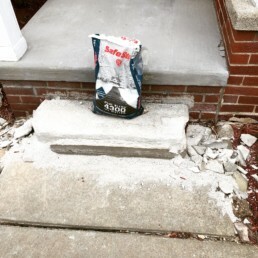 So whether you’re getting a new porch or taking care of an existing one, be sure that you use proper ice melters that will not damage the masonry work on your porch & steps. Whatever you want from your porch, Brickworks can make your dream a reality. Call us today here (586) 868-3234. We’re ready to get started when you are! What a great experience from the sale to the installation. The 4 man crew that was at my home was the most professional I have ever seen. Well done guys! Ian and his crew, including Dustin, were absolutely amazing! Super fast, professional, patient and really did phenomenal work. They did tuckpointing, replaced our damper, flue, applied HeatShield sealant to the chimney, and sealed the outside of the chimney among other things. They took time to answer all our questions and explain the work and really went above and beyond for us. Our chimney and fireplace are now safe to use and look amazing. Very competitive pricing and amazing work quality! Fast lead time, The crew addressed all my concerns. The quality of work was great the new brick work blended in perfectly with my older brick face. 10/10 for these guys! Our experience with Brickworks was excellent!! We had a partial chimney rebuild, a wall torn down, and a couple other minor things. The chimney looks fantastic and you can’t even tell where the intercom on the front of my house used to be. The crew that did the work were very friendly and efficient. Also did a great job cleaning up and were extremely careful on our new deck. I would highly recommend Brickworks and will use them in the future. I had Ali, Tom & Mel at my house on Friday and Saturday to rebuild my front porch and they did a wonderful job. Very professional and answered all my questions and came back Monday to clean it up and check in with me. Highly recommend this company . Shout out to James Ryan and crew! We had some tuckpointing done, they rebuilt the front of our porch and replaced the steps. The work looks great and for a great price too!! They were especially careful of my plants, which I appreciate! I highly recommend Brickworks. Daryl and Andy did an excellent job on our chimney today. They were professional and courteous. Did a great job cleaning up afterwards. We’ve already referred the to a neighbor. Highly recommend this company and this crew. Thank you guys! We have dealt with home leaks for 7 years, did everything. Finally had Jeremiah and his AMAZING crew come out, fix all mortar “pinholes” and sealed all the brick. LEAKS have stopped! I am so thankful to these guys for helping us with a major issue. Highly recommend and will use again hands down. Amazing work. Communication was great and the guys took their time. Rebuilding our chimney was a small job but they didn’t rush and did it right. I will have more jobs for them over the next couple years for sure. Our crew was polite, knowledgeable, and hard working. There was a designated foreman whose team worked as a well oiled machine. The work product was exemplary. The office was responsive and the material chosen to match our chimney repair was done with great care and attention to detail. Best quote by far on top of it all. I call this company summer 2016 for an estimate for a job i had planned for spring 2017, things happened and i wasn’t able to get the work done. Fast forward spring 2018 i called them in hopes that they still had my original estimate and wow the did and the guy even remembered my house. the guys showed up on time and got to work immediately the guys were very thorough. great company i wish i could rate them higher than 5. Contact Brickworks Property Restoration To Get Your Project Started Today!